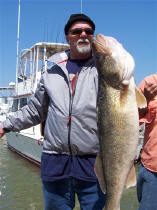 "Pooh Bear" is a fulltime Lake Erie guide that offers both fishing and leisurely Island tours aboard his massive 41' Viking charter fishing boat. 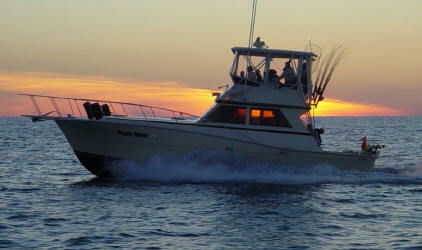 Rest assured this first-class Captain's charter boat stays over the fish as they move throughout the season. ABOARD A 41' VIKING CHARTER BOAT! Fish aboard the 41' Viking Yacht charter fishing boat, "POOH BEAR" equipped with modern electronics and the latest fishing equipment. 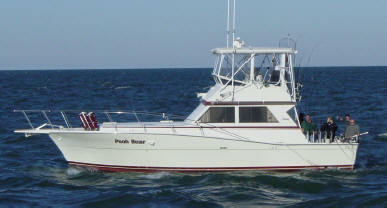 Put your family, friends, or clients on a very clean, well maintained large ocean going rough water charter boat the 41' Viking Yacht "Pooh Bear" which has a large cabin with couch and chairs. We can heat or cool the cabin for your comfort. 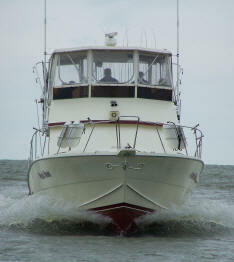 This Lake Erie charter boat weighs approx. 32,000 lbs. which gives you a comfortable and safe ride. Why charter a small boat when you can have a comfortable and safer large rough water Lake Erie charter boat for about the same price? * All the required safety equipment for a fun safe trip. * A private bathroom for your comfort. * A large cabin and enclosed flybridge to protect you from the elements. * The most up to date equipment and best rods, reels, and tackle available for fishing. * Coolers with ice for your fish while on board.